Indusheetala is the ancient Sanskrit girl name which literally means cool like the moon. Indusheetala is derived from the Sanskrit words Indu meaning "moon" and Sheetala meaning "cool, lotus, sandal". Thereby, Indusheetala can be loosely translated as "cool like the moon". As per USA popularity chart is not shown, name Indusheetala is not popular in the USA. 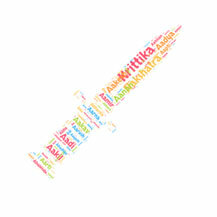 According to the data gathered from social networking sites, Indusheetala is an unusual baby name. As far as we can tell, Indusheetala is a rare name. Name Indusheetala is with good meaning attached to it. Indusheetala is not popular in the USA, because it is longer with 5 syllables and difficult to pronunciation too. Abhiru(lit. not terrific) means fearless, strong and powerfu.. Compound name composed of the elements Tri(Three) and lochan..
Madhughosh (Sanskrit मधुघोष) is the ancient Sanskrit boy nam.. In Sanskrit word megha(मेघ) means cloud. Sanskrit girl name Anisha (अनीशा) literally means powerlessn..
Means "thunder" in Sanskrit. It is the other name of Indraji..